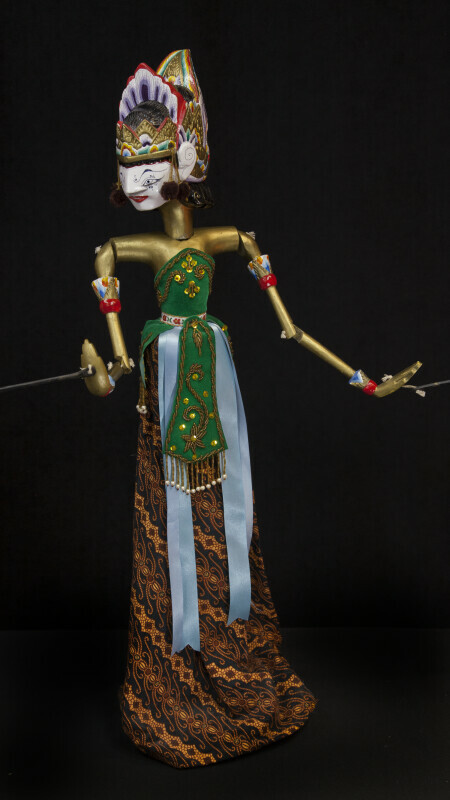 Wooden rod puppet (wayang golek) of Sita, the wife of Rama from the Hindu legend, called Ramayana. The doll puppet is manipulated by a rod that runs through the center of the body, as well as smaller rods connected to the puppet's hands. A puppeteer (dalang) controls the doll by using the rods to turn the head and move the jointed arms. The Sita doll is made entirely from wood and is wearing a velvet gown decorated with beads and a Javanese batik skirt. Her head and majestic crown are three-dimensional, carved and hand painted. The figure is 27 inches (69 cm) tall.